This unique wooden sign is covered with corrugated metal. 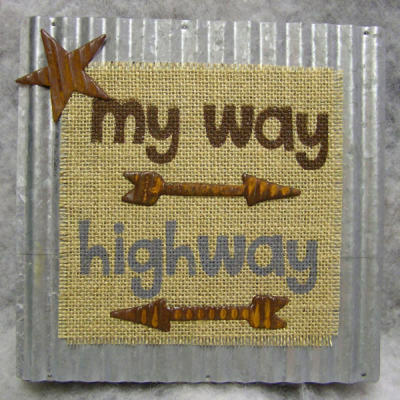 It has a burlap square that says "my way" with a metal arrow facing one way and "highway" with a metal arrow facing the other way. 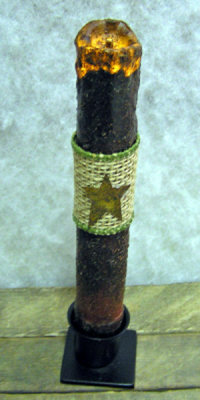 It also has a rusty metal star. It measures 8 x 8 x 1 1/2. This unique corrugated metal sign spells out the word "hope". 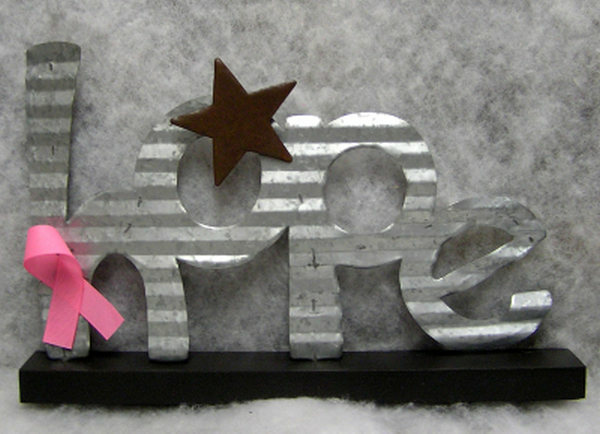 It has a metal star and pink ribbon and is mounted on a black wooden base. 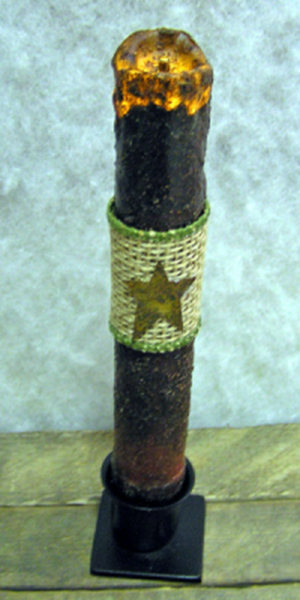 It can be personalized on the star or the base. It measures 8 x 12 1 1/2. This LED candle features a burlap ribbon around it with a rusty tin star. It uses 2 AA batteries. 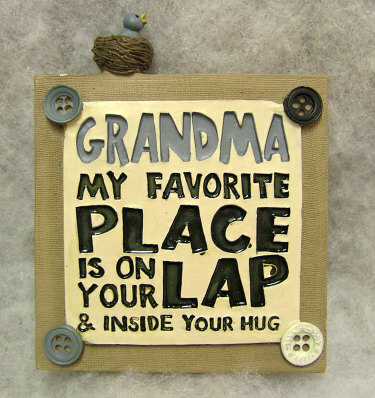 "GRANDMA....MY FAVORITE PLACE IS ON YOUR LAP AND INSIDE YOUR HUG" is engraved on this sign. 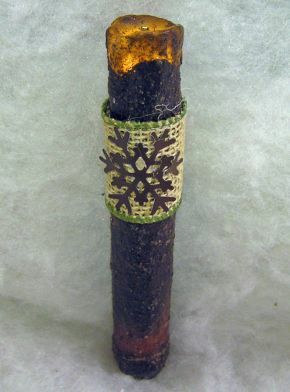 It has a button at each corner and a blue bird in a nest sitting on top. There is a stand on the back. It measures 4 x 3 1/2 x 1. 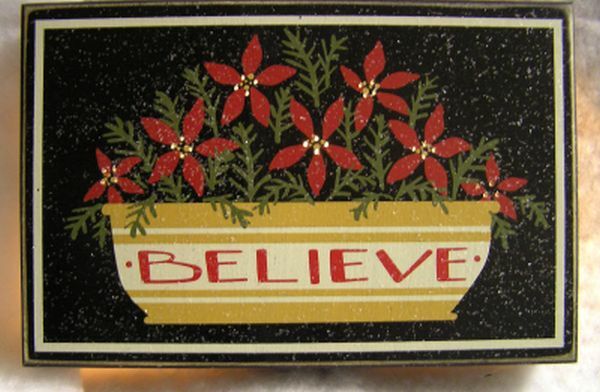 These ceramic tile coasters are a Manchester Cottage original design. 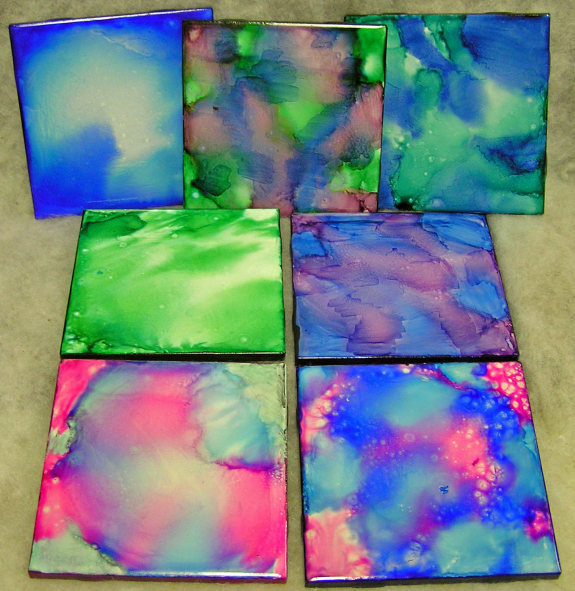 They are available in 10 styles: Blue Marbled, Red/Yellow/Blue, and Blue/Yellow (shown) and Blue, Blue/Purple/Green, Blue/Green, Green Marbled, Blue/Purple, Pink/Blue/Lt Green, and Pink/Blue (click on photo to see these options). 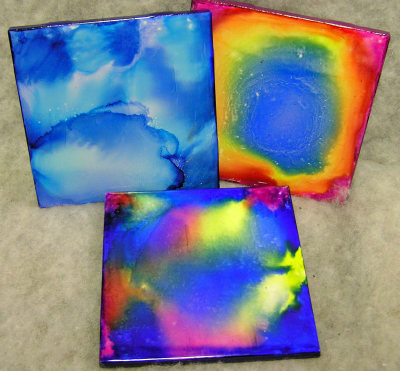 They come in a set of four, and, although the colors are the same, each coaster has a similar but unique design. They have protective pads under each corner. They measures 4 x 4 x 1/2. This unique Manchester Cottage creation features a corrugated metal back with a separate star at each corner. 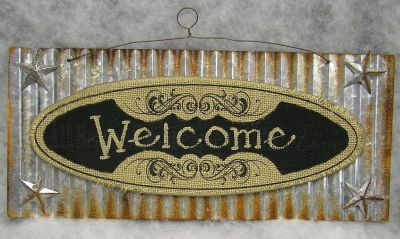 A wooden oval is attached to the metal, covered with burlap and painted with a design and the word "Welcome". You can also have a blank burlap oval personalized with your name or whatever you like (click on photo to see this option). It measures 10 x 16 x 1 + hanger. This sign has a wooden frame and a galvanized metal back. It says "H-O-M-E" on it with the "O" being a windmill shape. It measures 6 1/2 x 19 x 1. 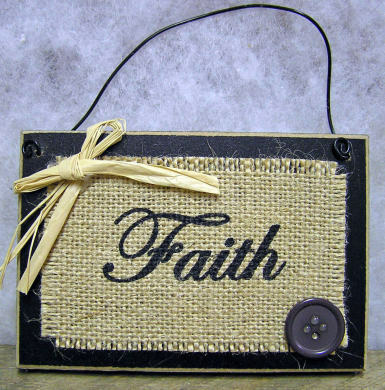 These wooden signs come in three styles: "Faith" (shown), "Friends" and "Family" (click on photo to see these options. 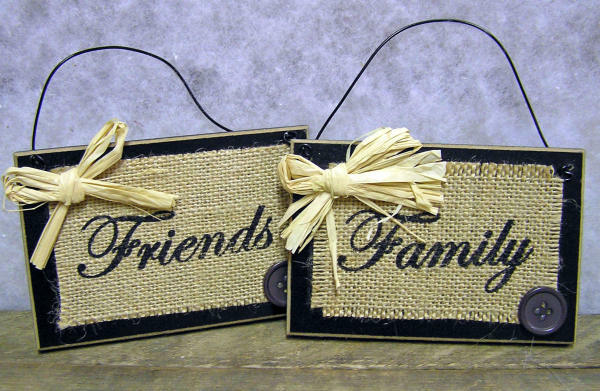 They have the words painted on a piece of burlap with a raffia bow and button on the corners. The background is black with sanded edges and it has a wire hanger. It measures 3 x 5 x 1/2 + hanger. 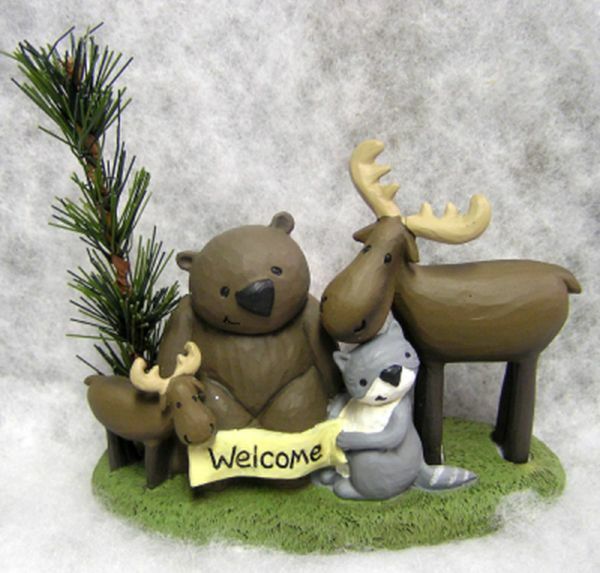 This group of friendly resin forest animals features a moose and baby moose, a raccoon, and a bear. They are sitting on a grassy mound with a pine tree beside them and holding a sign that says "Welcome". It measures 5 1/2 x 5 x 2 1/2. 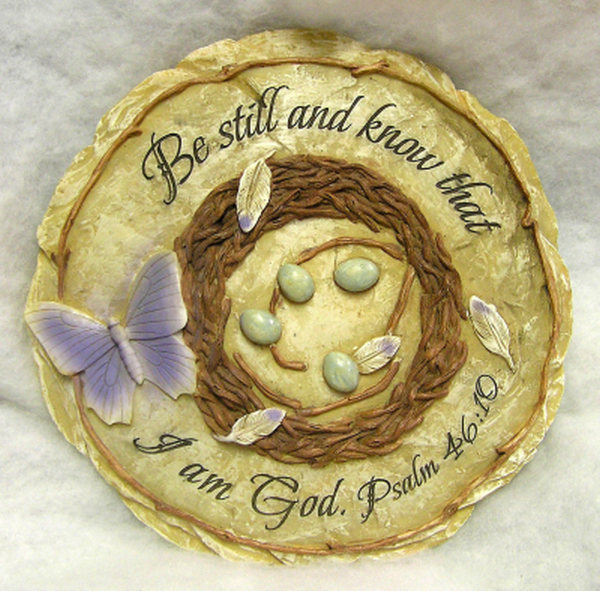 This resin stone has beautiful details...a nest with feathers, eggs, and a butterfly. It says "Be still and know that I am God. Psalms 46:10". It measures 10 x 10 x 1. 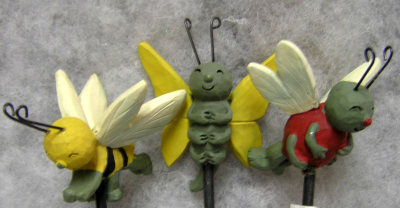 These cute little resin butterflies come in three styles: gold body with black stripes, gold wings, and red body. They have little wire antennas and are mounted on a 6" wire stake. These cute little resin garden fairies have lots of details and come in three styles: gold dress with lantern, orange dress with flower, and red dress with water can. 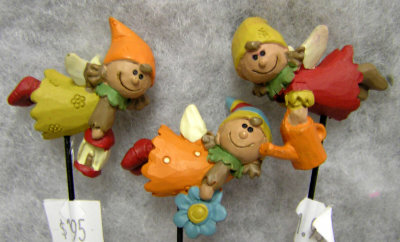 They have little hats, wings, and shoes and big smiles. They are mounted on a 4" metal stake. They measure 1 1/2 x 1 1/2 x 3/4 + stake.